One of the days during our December trip I was stranded with no boat or partner to fish with. I decided to go and explore. I wondered what species one could catch from the shore. The plan was to start at the launch pad and work down the shore from there on. I didn’t bring my small species setup with on this trip; therefore I decided to use my spinning setup. Luckily the Nanofil on this setup has such a thin diameter which makes it easy to tie a size 22 hook on such strong line (12lb line). The water visibility at the launch pad is excellent. I noticed many dwarf kurper/southern mouthbrooder swimming around on the grass pockets and on the edge of the grass line. The area around the launch has a lot of grass cover which acts as a safe haven for dwarf kurper. I even saw schools of dwarf kurper next to the jetty, this is a rare sight as they were swimming in the open water which is against their nature as they usually stay out of sight and hold close to structure. 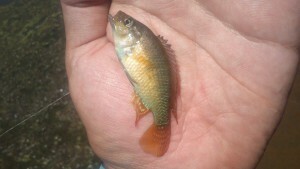 I saw small largemouth yellowfish prey on them while I was having a ball catching dwarf kurper after dwarf kurper. 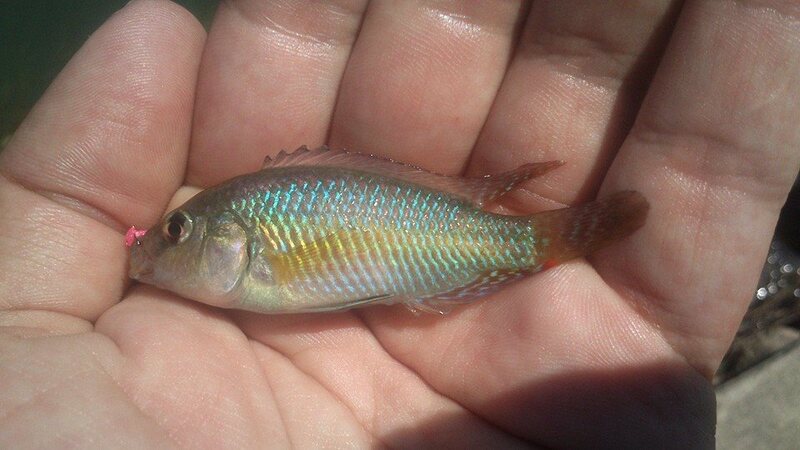 These dwarf kurper was super colourful specimens and there were some big specimens around (about 8 cm). Often dams with healthy bass populations have smaller dwarf kurper and fewer of them as well as bass prey on them. After catching about 15 dwarf kurper I decided to try for other species. 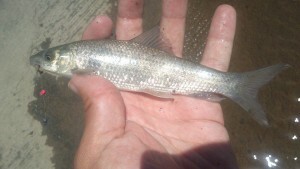 It is good to know that this dam has such a healthy population of dwarf kurper, seems like they are striving amidst all the smallmouth and largemouth yellowfish that prey on them – this shows that this ecosystem is very healthy. I’m pretty sure I spotted some vlei kurper/banded tilapia in the grass pockets, it was big specimens but they showed zero interest in my offering. I tried changing the colour of my Powerbait, but still they had lockjaw. I noticed a small Orange River mudfish feeding in the shallows next to the launch. This specimen also showed zero interest in my lure. After working for the fellow a while it spooked and swam away. I noticed many flashes on the launch pad; probably muddies feeding on the launch. So, I rigged a bigger piece of Powerbait on my hook to make it easier for the muddies to see my lure. I then cast my lure and commenced working it back to me. I hopped the lure on the launch pad with a long pause between hops. On my third hop of my first cast I was on! 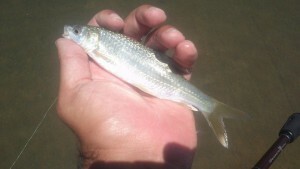 The fish gave a bit of a struggle before I landed it, it was a small muddy caught in the mouth on lure – success! At this stage I was on two species. I made another cast on the launch pad. 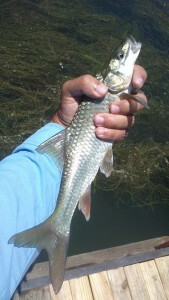 As I started hopping the lure back to me, my line went tight – something picked up my lure and was swimming with it! I set the hook and the fish commenced taking some drag. I was a small smallmouth yellowfish. I caught a few more of them with the casts to follow; they are a blast to catch like this as they hook themselves! 3 species, hooray! I decided to work th e jetty again, but this time I would work on the furthest edge of the jetty in the deeper water. My aim was to work the deeper water to see if I could manage to catch a bigger muddy. Yet again, I only managed to catch dwarf kurper after dwarf kurper. Between all the dwarf kurper som ething amazing happened! As I hooked another dwarf kurper and was busy pulling it up from the deep, seeing it flash as I bring it to the surface, something grabbed the dwarf on my hook and stormed off! It was a feisty fellow, it took some line! A short while later I managed to land the bugger; it was a small largemouth yellowfish and it swallowed the dwarf kurper which was on my line – there was no sign of the dwarf! This was the first time I caught a fish on another fish, pretty crazy stuff! Later on I managed to catch a few more smallmouth and two other small largemouth yellows on the launch. I ended the day with four species and an awesome story to share with you guys.